Rialto Pictures Jean-Paul Belmondo gets his kicks in "ClasseTousRisques." The late director Claude Sautet was best known to modern audiences for arthouse classics like 1992's Un Coeur en Hiver and 1995's Nelly et M. Arnaud. But the film that put him on the cinematic map was the 1960 gangster flick ClasseTousRisques. Now restored to velvety splendor and resubtitled, ClasseTousRisques is enjoying a proper American release, the initial stateside screenings having been few and dubbed. It's an electrifying example of the film noir of the late '50s and early '60s refined by the likes of Jean-Pierre Melville and Jacques Becker, and though the French didn't invent the style, there's a reason they acquired the naming rights. Former wrestler Lino Ventura, sporting a puss that looks as though it was dynamited into the side of a mountain, plays expatriate thug Abel Davos, and as ClasseTousRisques opens he and his family are making plans to return to Paris after some extended lam time in Italy. Co-goon Raymond Naldi (Stan Krol) is also in tow, and both men decide to help themselves to some relocation expenses via the perpetually alluring "one last job" --- never a sound idea, though always a trusty catalyst for action. Fast-forward to Nice (after a breakneck land-and-sea chase), where Davos finds himself in a tragically tight spot, forcing him to send out an SOS to his Parisian cronies. 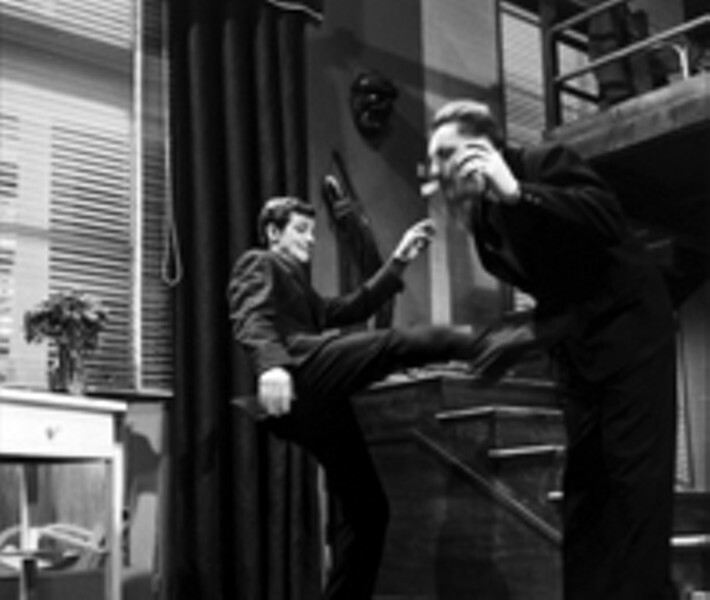 After much wringing of hands they subcontract the job of retrieving Davos out to freelance hooligan Eric Stark (played by the now-iconic Jean-Paul Belmondo, seconds before Jean-Luc Godard's Breathless made him the face of the nouvelle vague), an insulting gesture that Davos regards as a slap to his granite face. He thought he could have at least counted on honor among thieves --- even the allegiance-free Stark adheres to this ancient code --- so woe to the men who have crossed the increasingly lethal Davos. Like any noir worth its salt, ClasseTousRisques features voiceover, skirts with hearts of either gold or stone, and no actual good guys, just bad guys and worse guys. But this film is unique in that circumstances lead to a surprisingly paternal bond between weary loner Davos and eager loner Stark, though who's helping whom changes from time to time. Real emotional involvement in gangster movies is rare, which may be the reason ClasseTousRisquesis so satisfying. But what's with the French? It seems as though every time I turn around our Gallic amis offer up yet another important piece of cinema that's been languishing in someone's chicken coop for the last 400 years. Is it that difficult to keep track of your celluloid treasures, or is there actually a secure bunker under that McDonald's kitty-corner to the Louvre from which they're gradually parceling out France's really great films? The Australian Film Institute bestowed 13 awards on Somersault, CateShortland's feature-film debut about a troubled young woman unable to harness her powerful allure and the men taking advantage of her naiveté. Somersault premiered in Rochester last November at the High Falls Film Festival, and the accolades heaped on this flawed coming-of-age movie cause me to wonder whether the AFI saw the same flick I did, or whether Australian film production has slowed to one per year. Heidi, played by newcomer Abbie Cornish, runs away after getting caught smooching her mom's mulleted boyfriend, and then surfaces in a small ski resort town overflowing with alcoholics and opportunistic predators. She obviously has major daddy issues and seems to be under the sad impression that she'll gain love and acceptance by wrapping her arms and legs around others. Heidi eventually stumbles into a job and a place to live, and she also sets her sights on Joe (Sam Worthington), a one-night stand who really seems to want nothing to do with her. But he's just got to like her back, right? Somersault is admittedly gorgeous, albeit gimmicky, with cinematographer Robert Humphreys matching the film's candy-colored palette to its changing moods, and Cornish --- who resembles a sad CharlizeTheron --- handles her rather exploitive role as well as can be expected. But Shortland's well-meaning script falls shockingly short, the men in particular saddled with thankless and distasteful roles. Most likely the film's message was that people should, to paraphrase Daniel Johnston, be their own savior, but I witnessed no salvation --- or resolution, for that matter --- only a journey full circle. ClasseTousRisques (NR), directed by Claude Sautet, shows Friday, June 9, 8 p.m., and Saturday, June 10, 5 p.m., at the George Eastman House's Dryden Theatre | Somersault (R), directed by CateShortland, opens Friday, June 9, at the Little Theatres.